How do San Diego biotech companies fare compared to others in the nation? What companies are on the cutting edge and what new technologies are emerging? Find out these answers and more in this in-depth look at this exciting sector of our local economy. BioMed Realty Trust Inc. is a real estate investment trust (REIT) focused on acquiring, developing, owning, leasing and managing laboratory and office space for the life science industry. Since first representing Hybritech in 1981, the Burnham Life Sciences Group has built a business devoted exclusively to supporting and promoting the life science community. After years of growing concern over poor patent quality and out-of-control patent litigation, a bill with the most sweeping reforms in 50 years was introduced in Congress this summer. Time is money. That pragmatic advice offered by Benjamin Franklin in 1748 is one of the undisputed truisms of today's commercial real estate industry. The city of Poway invites life-science businesses to evaluate our community as a potential site for their next expansion or relocation opportunity. Knobbe Martens Olson & Bear, the largest intellectual property specialty law firm in the Western United States, has consistently been recognized by trade groups and publications as one of the leading IP law firms in the region, the country and the world. Gemini Science is a wholly-owned U.S. subsidiary of Kirin Pharmaceuticals, located in San Diego and is Kirin's sole agent in the United States for facilitating Kirin's pharmaceutical business development efforts. The Sidney Kimmel Cancer Center (SKCC) announced recently that $24.5 million in bond financing has been obtained through the auspices of San Diego County and Bank of America to fund the construction of a 79,000-square-foot research center. Today's first time biotechnology entrepreneurs are finding their fund raising experience dramatically different than that of their predecessors. Federal legislation (H.R. 2795, introduced June 8) is pending that, if passed, will make the most sweeping reforms to the U.S. patent system since 1952. Where the local biotech real estate market is concerned, year-to-date 2005 leasing activity has been healthy, evidenced by a diminishing number of opportunities for space under 20,000 square feet. The Centient Biotech Investor, a newsletter for investors in public and private biotechnology companies, has announced its Centient Top 10 Biotech list, identifying the ten companies it believes will outperform the biotechnology sector as a whole over the next twelve months. A day after it reported losing $16.1 million in the third quarter, San Diego-based Arena Pharmaceuticals Inc. (Nasdaq: ARNA, News) on Tuesday announced data from its positive Phase 2a clinical trial studying APD356 in 352 obese patients. La Jolla Pharmaceutical Co. (Nasdaq: LJPC, News) on Tuesday provided a summary of the status of the company's development program for Riquent, its drug candidate for lupus renal disease. San Diego attorneys Eric Kremer and Carmela Dunn Nicholas of Pillsbury Winthrop Shaw Pittman LLP advised Biosite Inc. (Nasdaq: BSTE) in its $28.2 million acquisition of approximately 26 usable acres at the Fenton Technology Park in the Miramar area of San Diego. The negotiation of the purchase documentation and the title due diligence along with the negotiation and documentation of the design and construction contracts were also completed by Pillsbury, working closely with Biosite's in-house facilities, finance and legal departments. Eisai Co. Ltd. and TorreyPines Therapeutics Inc. jointly announced Tuesday the signing of a new research agreement that focuses on the discovery of genes responsible for late onset Alzheimer's disease. San Diego-based Biosite Inc. (Nasdaq: BSTE, News) announced Friday that it has increased the share reserve for its 2002 Nonqualified Stock Incentive Plan by 400,000 shares. The company also modified the plan to allow for the grant of inducement stock awards to officers in accordance with applicable Nasdaq rules. Reinforcing the strong performance in the capital markets in the third quarter, the biotech industry raised almost $10 billion in financings and partnering, according to Burrill & Co.'s Quarterly Biotechnology Report, which tracks the ongoing performance of the biotechnology industry. The headquarters for stem cell research may not be headed here, but San Diego is still positioned to play a major role in the development of the new technology. And the local legal community is preparing to play its part. A comprehensive bill that would overhaul U.S. patent law has ignited the passions of many, from the individual inventor to big corporations. Learn about innovations and trends in San Diego’s thriving biotech and life science industries. 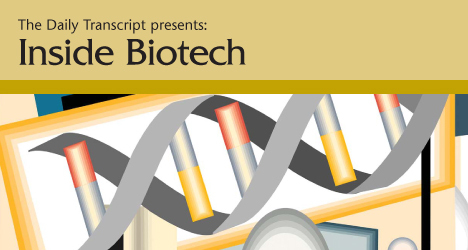 Take an in-depth look at San Diego's vibrant life sciences sector with our annual publication, Inside Biotech. Explore the latest technologies, newest medical and drug discoveries, financing, IP issues and more. The Daily Transcript takes an in-depth look at the biotech sector, including financing, educational needs and the latest research coming out of local companies.